Reza Announces 2019 US Tour! REZA has taken the art of illusion to a new level, delivering his rock concert style magic show to audiences across the globe. Don’t expect rabbits out of hats! Reza's current tour transports concert level lighting & production merged with the most incredible cutting-edge magic in existence today. Reza has garnered a world-wide buzz and loyal fan base with his passion for creating signature grand-scale illusions such as making motorcycles and helicopters materialize out of thin air! Reza’s unique brand of illusion has landed him on popular reality shows across 31 countries, including recent US TV appearances on A&E’s Duck Dynasty and The CW’s Penn & Teller : Fool Us. Audiences can expect to witness such mega illusions as passing through the spinning blades of an industrial fan, a record breaking recreation of Houdini’s most famous stunt, and the appearance of a real helicopter, live on stage. More than a magic show, Reza infuses stage of the art production elements, masterful comedic timing, and numerous interactive & inspirational moments, allowing the audience to experience the magic first hand. Perhaps Reza’s greatest secret is his uncanny ability to communicate his performance art on such a personal level. Young and fresh, Reza’s new show, “Edge of Illusion,” has earned various awards including “Magician of the Year.” Reza is intriguing, engaging, and captivating. He isn't just a magician. He is a world-class entertainer. 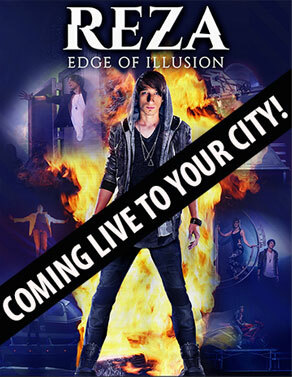 Click below for more information on bringing Reza to your city or event!